Dallas, TX (August 14, 2018): David Weekley Homes, the nation’s largest privately-held builder, hosted its fourth annual, companywide CA+RE School Supplies Drive in 17 cities across the country. 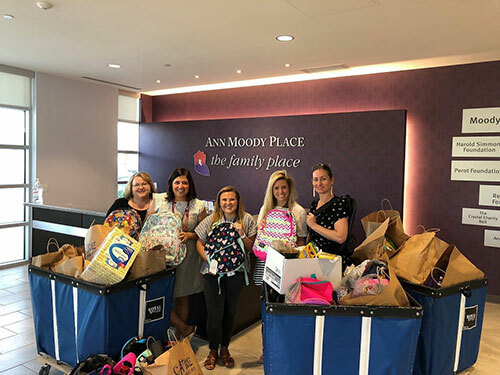 In Dallas, school supplies were collected for The Family Place, which provided shelter, counseling and health evaluations to victims of family violence. Approximately $1,200 in supplies were collected from homeowners and real estate partners during the drive. This donation provided more than 100 students with the supplies needed for the school year. “We were thrilled to present so many donations to The Family Place this year, in addition to a $5,000 donation from the Weekley Family Foundation for new tricycles, desk chairs and outdoor play equipment,” said Susan Conway, senior sales consultant with David Weekley Homes in Dallas. David Weekley Team Members donated school supplies to The Family Place.